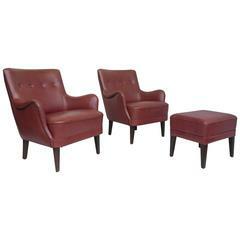 Pair of mahogany armchairs with natural sling leather back, Denmark 1960s. Pair of wooden Windsor armchairs by Luigi Ercolani. Danish pair of leather armchairs from 1960s. Black aniline leather and teakwood with nice brass details.